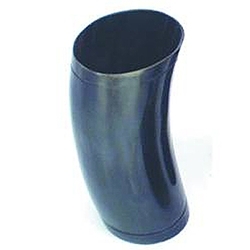 Our 5" Horn Drinking Cup was a common early accessory was a simple cup fashioned from cow or buffalo horn. It was easy to carry in a knap- sack, inside a hunting shirt, a pannier or a saddlebag. Our cow horn cups are light-weight and handmade. Decorative only.